This year, it might be time to take that extra step, looking just beyond the living space of your house, and venturng into— gasp!—the garage. It’s that dirty, dark place where you shove the tools and the yard supplies. Can you even move around in yours? With one or two cars taking up residence, have you managed to create enough space for the rest of your stuff, while at the same time being able to move around? If your answer to that last question is no, you might want to consider taking a trip over to the GarageTek’s Edina showroom. GarageTek has products and services designed to help you maximize your space. Wall units, ceiling units, cabinetry, bins, and brackets…it has a solution for your storage needs. GarageTek even has clever ideas to help turn your garage into a functioning workspace. Now that winter is over, you don’t want to look at the snow blower for the next six months, so hang it from the ceiling, or put it on a shelf—remove it from your eyesight! Whatever your storage needs, Garage Tek has a solution for you. This business even will come to your house to consult with you about what you need, help design the perfect garage for you, and then install it. Get started by going into the garage, and assessing your needs. If the sight of years’ worth of junk is staring back at you, make a list of the things you know you need to keep. Does it seem like way too much stuff? Don’t panic. Your garage has more room than you think. Shelving units on walls can go high; the ceiling can double as an extra storage area; and wall brackets can keep things like bikes, hoses, and shovels off the floor. Getting organized in the garage isn’t all about clearing stuff out of the way—it’s about realizing its potential. How would you like to be using your garage? Can you find any way to get extra stuff from the house out of there? Who knows, once you’re done organizing the place, you might be ready for some improvement, like changing the floor and ceiling, so you don’t get oil spots or water stains on the ground. Let your garage imagination run wild, and don’t worry about bringing the dream to reality, because GarageTek will do it for you. So, when that cleaning bug hits you, don’t just stop on the inside of the house. 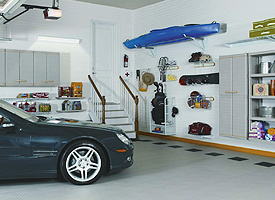 After all, shouldn’t the garage be just as clean and organized as the rest of your home?